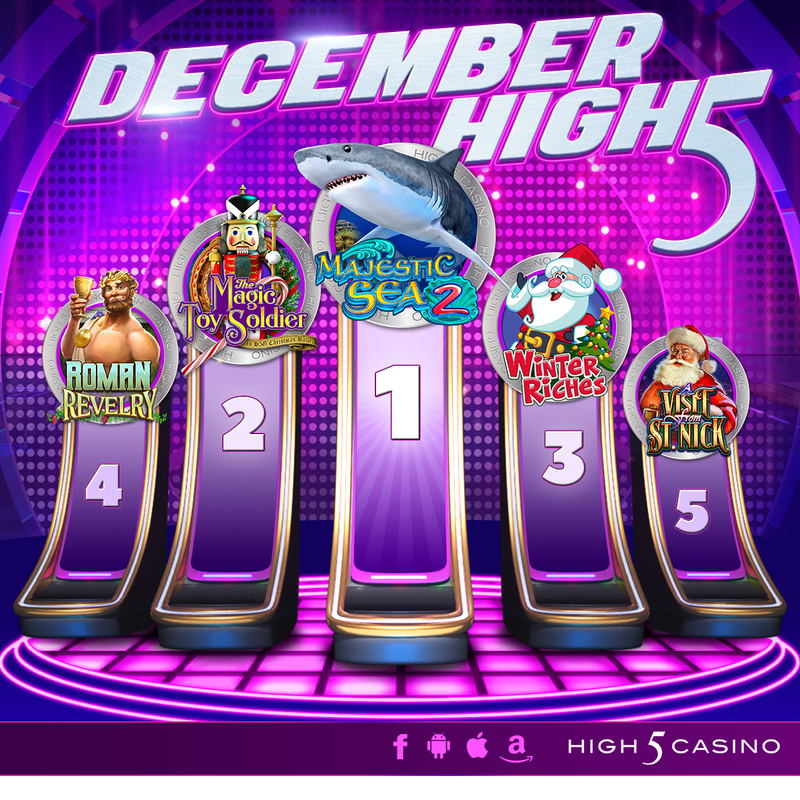 High 5 Moment: High 5 Casino’s Month In Review for December 2018! High-5ers were merry with HIGH 5 MOMENTS in December! High 5 Casino jingled all the way through the month with FOUR new games! As of December, H5C released 286 slot games, introducing Majestic Sea 2, Roman Revelry, and two new seasonal games, Winter Riches and Bling in the New Year! Let’s also not forget the return of two favorite seasonal games that made their way back to your casino lobby last month: A Visit from St. Nick and The Magic Toy Soldier! Each new game was followed by a weekend-long XP event. Featuring an XP boost in selected theme games, you took advantage in leveling up faster while playing during the Aquatic Adventure XP, Colosseum Jackpots XP, Dashing Through the XP, and Eat, Drink, and XP. Starting on Friday, December 14th, High 4 Casino began its countdown to Christmas with a 12 Days of Spin-mas Cheer XP event! You were able to enjoy various XP boost in Empress of Time: Destiny, Diamonds by Da Vinci, Rags to Ribbits, Wild Tusks, Liger Loot, Legends of Troy, Captain Payback, Triple Monkey, Platinum Powder, Winter Riches, The Magic Toy Solider, and A Visit From St. Nick! Towards the end of the month, trickling down towards the end of the year, High 5 Casino begin the countdown to the New Year with a contest! We invited players to join the H5C’s Look Back at 2018 Contest by sharing what their favorite H5C moment was in 2018 and why for the chance to win 200K coins! Submissions were open from Sunday, December 23rd to Tuesday, January 1st. 125 winners were announced and rewarded on Wednesday, January 2nd, 2019! Which game gave you your High 5 Moment in December? What did you enjoy most about High 5 Casino last month? Comment in the conversation bubble located on the top right corner of your screen and let us know! As the host of a lavish Holiday Ball, you’re tasked with keeping the spirit of Christmas alive. Known around town for always having the biggest and best party, you must top the previous year’s gathering! Searching high and low for new, fun ways to add to the night’s festivities, you can’t seem to find anything or anyone who can help in spreading holiday cheer. Well, you’re in luck. High 5 Casino has just the right people to add to your guest list! Extend a warm Holiday welcome to The Magic Toy Soldier. Spreading joy among the children of the town, he will be the life of the party. As one of Santa’s original helpers, he is known for guarding all holiday cheer and bringing a smile to everyone’s face while enjoying a warm glass of eggnog. With all of the singing and dancing, he’ll take your guests on a magical journey they won’t soon forget. Very few can create an atmosphere as delightful and magical as he can. With the idea of cheer in mind, what’s a holiday party without A Visit from St. Nick? Delivering presents all around the world, there’s no one to better entice the spirit of the Holidays than Kris Kringle himself. He’ll surely bring a holly jolly vibe all the way from his Winter Wonderland to yours. With his gift for giving, everyone in attendance will be filled with laughter and joy! Which holiday character would you choose to attend your party? Do you prefer magical soldiers or a warm visit from the President of the North Pole? Comment in the conversation bubble located on the top right corner of your screen and let us know!